Bushido - the Way of the Samurai - is right at the heart of Japan. There’s an old saying in Japan, handed down the ages, that a samurai’s sword is a samurai’s soul. The samurai sword is designed for ultimate efficiency. There’s not a single ounce or inch of it that doesn’t do its job. The blade, with steel tempered time and time again, isn’t just a masterpiece of functionality - it’s an exquisite work of art in its own right. Crafted by the hand of a master swordsmith, the steel takes on a beautiful pattern. It sparkles like the stars in the autumn sky, they say, or like the Milky Way. That’s how the swordsmiths put it, and we know that they’re intent on creating this sword as a thing of beauty. Aizen’s “Kurogane” series follows in the footsteps of these masters. We’re equally committed to making works of art that look just as good as they sound. The first generation of samurai swordsmiths in Japan worked through a process of trial and error, or so the story goes. They had to find the right materials and discover the right processes to make a sword that would stand the test of combat on the battlefield. At Aizen we were equally demanding of ourselves. We mixed and matched hundreds of patterns to achieve the sound we were looking for. We pushed ourselves through countless manufacturing trials. And we finally got there. We’ve achieved a totally unprecedented sound and an unmatched beauty, blending 64 different metals, with titanium the dominant one, delicately balanced with our unique in-house resin. When light hits off it, it sparkles like the stars of the Milky Way, which give this mouthpiece an unquie look. 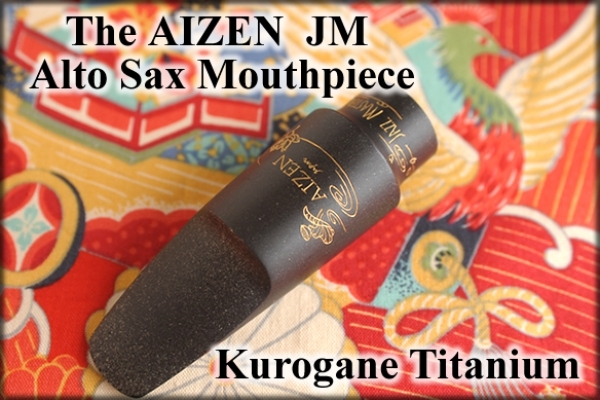 When we work on Kurogane mouthpiece, it actually wear my diamond tooling away. Making them is a labor of time, and we craft them one by one. Therefore, we need some time to produce Kurogane mouthpieces.